I’d never used a smartphone for any length of time before but I was starting to look into the various Android devices as something to replace my old Nokia dumbphone. iPhones didn’t really do much for me because, although they look fantastic, I’d rather not be tied into iTunes and the whole Apple microcosm. Then, along came WP7 and surprised everyone by actually bringing something new and innovative to the table. It hits the sweet spot between great looking but controlled interface with a choice of designs & features from different manufacturers. I would initially be a bit apprehensive about using a version 1 bit of kit (actually v7.0.7004.0 to be precise) but this phone fell into my lap and as a follower of the build up to the launch I was very excited to see the new experiences it would bring. One of the catchphrases from Microsoft was “Glance & Go”. This was shown off in the “Really” adverts (although the message was completely reversed by Orange in the UK ) demonstrating that people have stopped interacting with real life and are just constantly staring at their phones. After a month’s use I can agree that, if you want it to be, you can very easily see updates at a glance or quickly send an update to Facebook etc. all with one or to presses. The start screen is relatively customizable and you can get loads of features all showing up on that initial display. The video below is from the UK Windows Phone Team demoing how the Start screen works and just how quickly you can get a grip of news, updates, photos etc. Thankfully, the phone does a lot more than offer a glanceable start screen and I have found myself in exactly the same position as some of those people in the Really ads. In fact, I would feel quite robbed if I got a £400 phone and couldn’t get immersed in it for hours. One of the things I like about the OS is that it is not just a screen full of apps or folders. I’ve got a laptop for that kind of working environment. Instead, you are given “Hubs” for different activities like Games, Pictures, Music and People. These are way more than a folder of apps. They are interconnected experiences that really bring all your content into a useful and engaging display. That sounds a bit waffley but sweeping through the different panoramas on each hub is a real pleasure. The long list of apps is still there. I have about 100 apps on my Omnia 7 and scrolling through the list is quick enough with a finger swipe but I would prefer to organise them into differently grouped lists. Hopefully that will come in a future update. The great thing is that the developers of these apps can link into a hub as well as it’s self-contained program. The best example of this is how the YouTube app shows your history in the “Music & Videos” hub or how I can open the “Colorizer” app from the camera mode to alter my photos. I have been a bit disappointed by the amount of apps that exploit this functionality. I guess it is partly because a lot of developers have come from Android or iPhone backgrounds where that opportunity may not be available. Hopefully, as the apps mature we will see deeper integration with the OS. If you’d like to see what my favourite apps are you can check out my What I Use page. I’ll keep that updated as I discover new apps or get tired of old ones. The Zune was Microsoft’s mp3 iPod competitor. 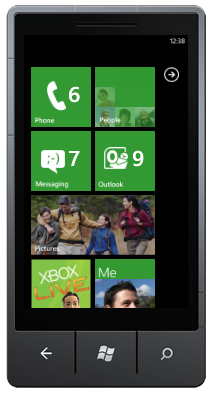 It was the first incarnation of the swishy Metro UI style and the team that worked on it also built WP7. 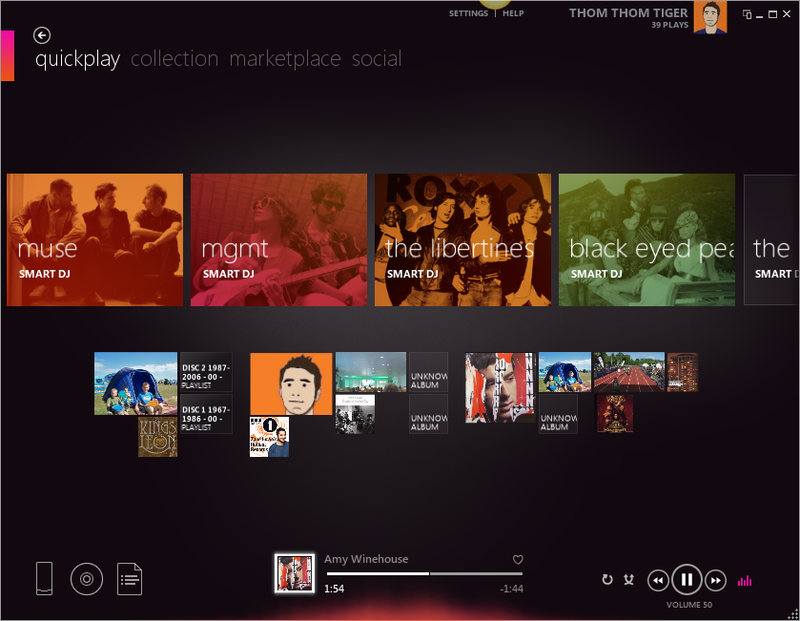 Music, Videos and the whole Zune service are all integrated well into the phone. I can hear a song on the radio or TV, use the Shazam app to identify it and instantly download it to my phone. That is pretty much the ideal scenario, not a PC or the dreaded iTunes in sight, all done directly on the phone through 3G or Wi-Fi. The Zune client software is used on a PC or Mac to synchronise your existing music and videos as well as subscribe to podcasts. It’s very nice software and I reviewed it a few months ago. It will also be used to apply any of the updates that come from Microsoft. However, the Phone section that is added to the Zune client is far from perfect. I find the settings overly confusing and it seems much more of an afterthought than the rest of the software (which, in all fairness, it is). Windows Mobile users will be used to having ActiveSync or the Windows Mobile Device Center to manage their phones or PDAs. Zune doesn’t allow you to explore the phone’s file system. You also can only connect via USB, not Bluetooth, which is a bit of a hassle. It does let you synchronise via your home Wi-Fi but this has a few caveats i.e. your PC must be on (obviously) and your phone must be plugged in to a wall socket. In reality this means you need to leave your PC on all night while your phone is charging. Not very environmentally friendly. Hopefully this is another feature for Microsoft to refine with future updates. Does it work as a phone? An important feature that sometimes gets overlooked is how it handles phone calls. I think I would probably give it a C+ grade. For a start, I don’t like how you have to first bring up the recent call list and type or touch a name. The keypad is hidden unless you bring it up which seems very odd to me and makes it awkward when using an automated phone system (e.g. “press 1 for Jelly fish, 2 for Sweets). I could use voice dialling to speed this process up by saying something like “Call Wife at home” but that just looks stupid! When you talk on the phone with it against your ear it cleverly turns off the screen to save power, however it is quite a long lag (at least 2 seconds) before it comes back when you take it away. Another gripe becomes apparent when you are using it hands free. I have my phone stuck on my dashboard of my car. To answer it I need to swipe up, press answer, press the options button and finally press loudspeaker. Not something you can do while driving, meaning that you will need to pull over to answer safely. These are all things that can be fixed with a bit of tweaking from Microsoft so I’ll add that to the growing wish list for future updates. When I first envisioned this review I thought it would be a long list of Pros and Cons similar to my omnia7 review but it didn’t quite feel like that would do it justice. I have really enjoyed using my phone and love getting it out in public! Having a capable internet browser in your pocket is a god send and I have hardly touched my home PC since I’ve had the phone. Sending texts and emails is a pleasure and very easy with the intelligent virtual keyboard. I can type quickly and if a mistake isn’t auto-corrected it is easy to change it with a quick tap. I also now enjoy standing in queues. It is another excuse to play some of the excellent free games that are available. I haven’t paid for an app or game yet but I’ve come close (Fruit Ninja!). I have bought an album through Zune on the phone and that worked flawlessly. I am also pleased that all my photos are backed up to my PC every time I connect but also to a private SkyDrive folder (despite the reduced resoution). I’ve gone easy on the critique because it is just version 1. Microsoft have a lot to do in future updates and hopefully they will come quickly as promised. They can’t afford to fall behind and they need to build up on any momentum they may gain. By the end of 2011 I would hope to see WP7 as one of the top 3 mobile OSes (with iOS & Android) but Microsoft need to push the advertising more and explain just how new and great the phones are and why they are different to Windows Mobile 6.5. Just the other day a man I was speaking to said he would be worried that if he had a Windows Phone it would get the same viruses as his PC! These are the kind of beliefs that Microsoft need to quash quickly. I also think they were stupid not to release a Zune HD2 internationally. It would be a great way to spread the OS around and compete directly with the iPod touch. We shall wait and see what the future brings with baited breath and crossed fingers. I like your review too! The more people talk about WP7 the better!